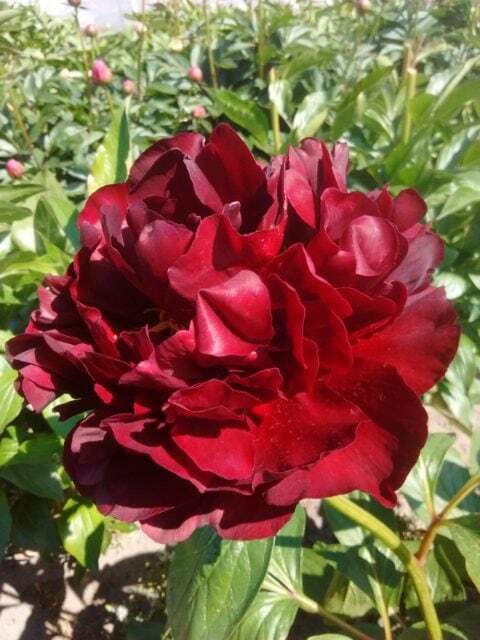 A very distinct peony with very beautiful foliage and nodding flowers. 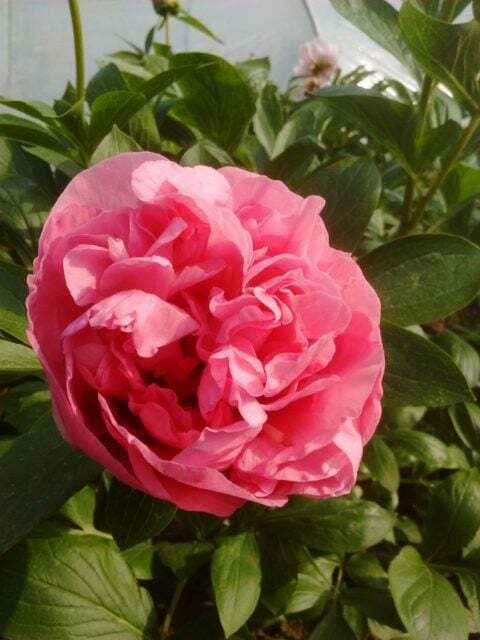 Very floriferous and fast growing. The subject of Windflowers has been discussed in the past but I think that a brief updating or summary would help the interested breeders. If I well remember Late Windflower has been reported as being a fertile pod parent even if the percentage of resulting seeds is low. Does it make any pollen? Red windflower is pollen fertile but can be used as pod parent? I can only speak about Late Windflower, but here it will make a few seeds every year if I put tetraploid pollen on every single flower that opens. So far I do not have any seedlings, but if I keep getting 4-5 seeds every year I am sure to have some sooner or later. Those in climates where it does not freeze almost every night as it does here, may get more seeds than I do, but my current sense is that it is *not* a fertile tetraploid. 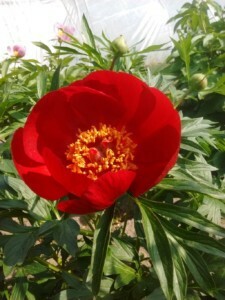 The parentage of Late Windflower is Beresowskyi x Emodi. As I understand, Beresowskyi is closely related to Veitchi. 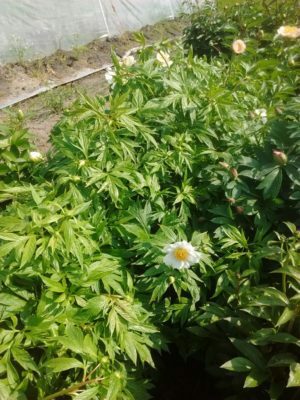 Early Windflower is Veitchi x Emodi, and as I understand they look almost identical, with “Early” blooming a week or so ahead of Late. And no, Late Windflower does not make even one grain of pollen in my experience, which means that you do not have to bag the crosses to prevent self-pollination. Before we go any further, I think we must mention Sparkling Windflower. Sparkling Windflower = Early Windflower F-2 It is a Saunders seedling of Early Windflower and another unknown parent. So far it has yet to make a seed in my garden, but it’s pollen is very useful on tets. In my admittedly limited experience, even first-year seedlings with Sparkling Windflower as the pollen parent will exibit distinctive foliage. Red Windflower does not have quite the same pure parentage as Late and Early Windflower have, even though they are involved. Late and Early have only two species in them, while Red Windflower has four….or five. Red Windflower is presumed to be tetraploid, and is apparently short in height, whereas Late and Early are both tall but quite graceful. I do not know if Red Windflower is currently in commerce, but Bill S. may have it. As an aside, Carnation Bouquet = Blushing Princess x Sparkling Windflower. 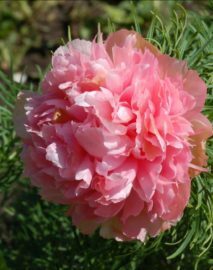 At this point in time, Carnation Bouquet may be the only other commonly available member of this group of peonies which have Late or Early in their background. Like the others, it has distinctive foliage, and seems to like sand. 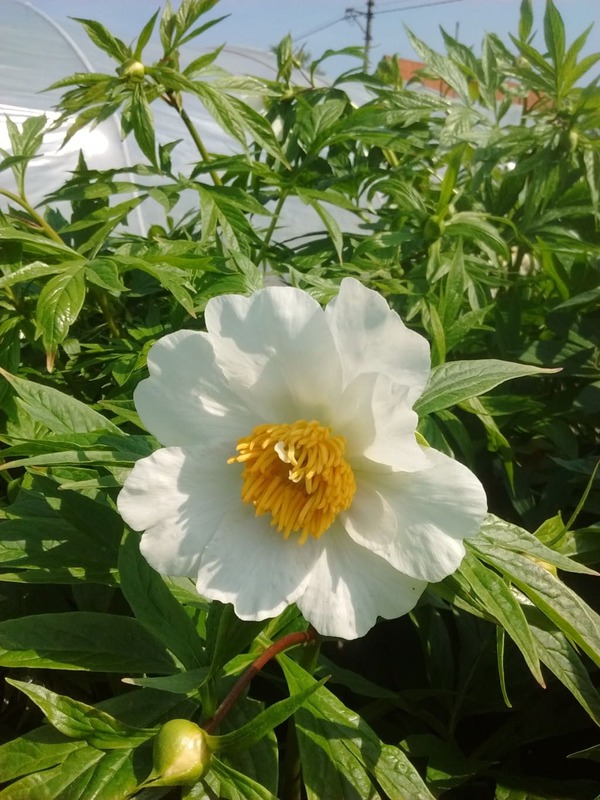 It is a fertile tetraploid, generally never makes pollen, the majority of it’s carpals are in the process of turning into petals, but if you find ones that are well formed they will make seeds. I may be wrong about this, but it is possible that only Late and Early have the habit of making many ( sometimes as many as 6-7 ) small outfacing flowers along the length of each stem. This type of flower placement is *very* attractive and one goal of breeding would be to continue this graceful plant habit into further generations, but in other colors than white. Late and Early have the reputation of not always being winter hardy. But where I live, once they have come up, the plants and flowers seem very resistant to our many spring frosts. Those who have not grown Late or Early should give them a try. 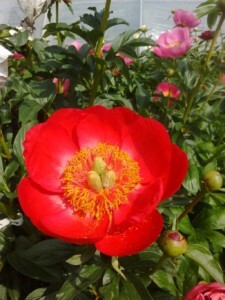 They are particularly attractive, have a long bloom season, increase stems rapidly, and unlike some other peonies, seem to have an affinity for sandy soils.